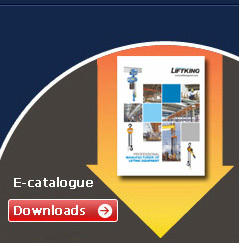 Liftking brand electric hoists is a small lifting equipment, small size,light weight, simple operation and easy to use etc.. Widely use in industrial and mining enterprises, storage dock and other places. Electric hoist including electric chain hoist and electric wire rope hoist. Electric chain hoist is small lifting equipment.consist of motor,transmission and sprocket wheel.liftking brand electric chain hoist is made in accordance with international standards. We adopt the low vibration, low noise design ,high-performance cylindrical rotor to start the motor. Closed structure aluminium alloy shell.light weight and sturdy, good heat dissipation, continuous service up to 40% efficiency. Magnetic brake system: The brake is made by good wear resistance copper-based fiber. When power off,the brake work immediately to ensure the safety. The gear box use heat treated alloy steel. High precision with low work noise. The inverse phase sequence protecting device control the circuit not to work in case of wiring error in the power supply. Heat treated alloy steel chain, it can be used in rain,sea water, chemicals and other harsh conditions. Forged and heat treated hook with 4 times tension,360 degree rotation, safety tongue piece protect the safe working environment! 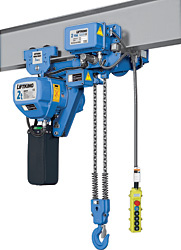 Our electric chain hoist lifting weight is from 0.5t to 30t, and the lifting height is from 3m to 120m. The operator can control the electric chain hoist on the ground by following with the button switch, can also be manipulated in the control room, or distant control by the wireless remote controller. The electric chain hoist can use a fixed suspension or with single track power trolley and manual trolley or electric trolley! 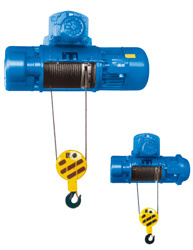 Liftking brand electric chain hoist are widely use in factories,warehouses, wind power, logistics, port and other industries, mainly use to lifting and handling cargo,hung up heavy objects or repair large-scale machines. It can be installed on the I-beam and also be fitted with the electric or manual single beam,dual beam,cantilever, gantry cranes and other cranes. 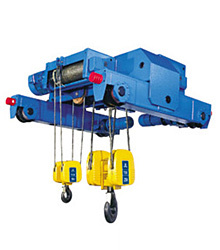 Liftking brand electric wirerope hoist are widely use in factories,warehouses, logistics, port and other industries.